As former Art Bell listeners are surely aware, Stull, Kansas has quite the reputation. Supposedly, you will find the staircase to Hell there. Other strange phenomenon have been attributed to the dusty burg, but a new film set in 666-ville completely squanders its weird mythos. Instead, the scariest this about this paint-by-numbers horror show is the fact it bills itself as the first film from Slasher Films, Guns ‘n’ Roses guitarist Slash’s production company, because that implies there will be more. 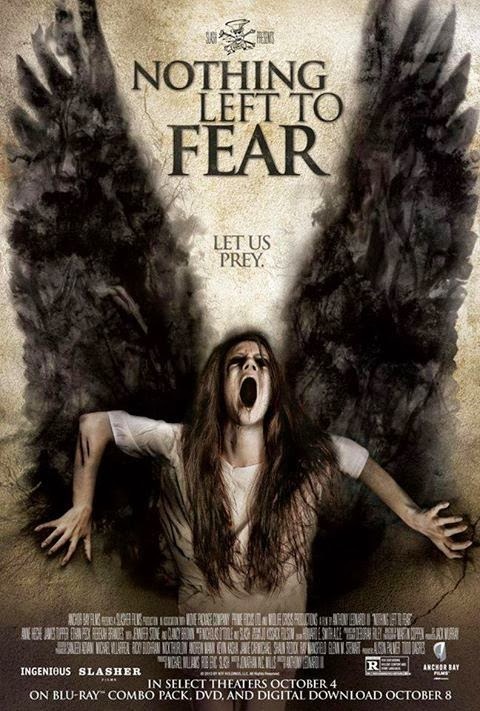 On the eve of its DVD release, Anthony Leonardi III’s Nothing Left to Fear (trailer here) opens this Friday in New York. It looks like the America we know, but in this alternate reality Al Gore never invented the internet. How else could the city fathers keep luring innocent families to town so they can be sacrificed? Hey, somebody’s blood has to re-seal the gate to Hell. Naturally, the ringleader of the infernal cabal is the village pastor. He is convinced this is simply the town’s cross to bear, like the idiot uncle who must endured at holiday meals. The latest suckers are the Pastor Dan Branford and his family. He thinks he has been recruited to succeed the retiring Pastor Kingsman, but he would be wrong. As soon as the move in, their teenage daughter Rebecca starts having nightmarish visions. Soon thereafter, her younger sister comes down with a demonic case of nausea after biting a prehistoric canine tooth hidden in a housewarming cake. It all seems rather strange, but Rebecca does not have much time to think about it. She already has a date set up with Noah, Stull’s undisputed brooding champion. Frankly, Fear is so tired and predictable, it leaves viewers plenty of time to ponder the head-scratching inappropriateness of its Rooseveltian title. It is also kind of mind-boggling to see Anne Heche play the mom and a preacher’s wife in a horror movie. Former Wizards of Waverly Place star Jennifer Stone also looks out of place for multiple reasons as the increasingly Gollum-ish Mary. Even Clancy Brown, who is ordinarily genre gold, looks like he is mailing it in during a government shut-down as Pastor Kingsman. Once again a Christian clergyman acts as a creepy tool of evil. Remember when The Exorcist featured a Catholic priest sacrificing himself to save an innocent. It was only the second biggest film of 1974, eventually grossing over 230 million dollars after several re-releases. Left to Fear certainly won’t be repeating its mistakes. Yet, what is perhaps most baffling is the lack of reported Stull legends. It seems there has been a lot of talk about the cemetery, a hanging tree, a “devil’s road,” and young boy burned to death by his father, but you will not find any of that here. Left to Fear does not even have a staircase worthy of a heavy metal album cover. Regardless, the greatest sin of Left to Fear is its dull pokiness. While it is among the first of a raft of horror movies releasing this month, it is also among the least. Not recommended, Nothing Left to Fear opens tomorrow (10/4) in New York at the AMC Empire.